Over the years and during our travels, we have had many memorable meals, some good, some bad, but on the whole more good than bad. I thought Mondays might be a good time to remember some of those meals. One such meal was a dish of noodles in Xi'an, an old city in China. 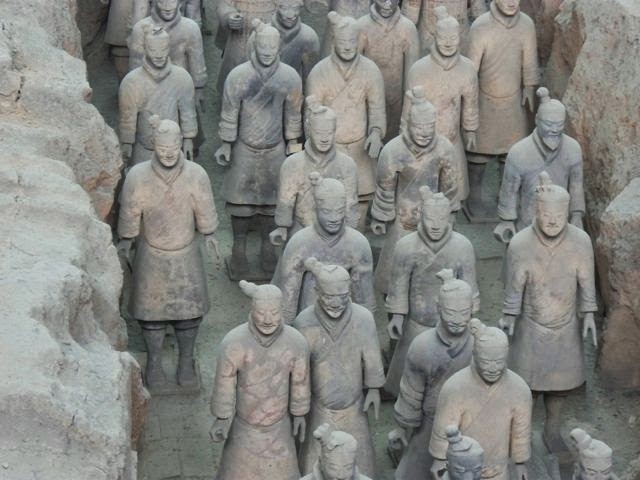 Xi'an is most famous for the Terra Cotta Warriors and that is what brought us there. But when we headed just a wee bit off of the beaten tourist path, we began to wonder if maybe we were the greatest attraction in Xi'an. In Bejing our pasty white family of five was constantly being stopped and asked to pose for pictures by Chinese tourists. "Three children!" they would say to me or the Professor, "So lucky! So lucky!" After thinking about the one child policy and the fact that our three are quite close in age and have strawberry blond hair, perhaps this attention wasn't surprising. But in Xi'an the attention rose to a whole 'nother level. When we walked down the street, we pretty much stopped traffic. People at road side cafes stopped with food held halfway to their mouths. Couples stopped their conversations to stare open mouthed at us as we walked by. Small children followed us down the road. So, getting to the meal. It was dinnertime and we were hungry after a day full of sightseeing. Choosing a place to eat while traveling is often not one of our finer moments. The Professor and I are both cheap frugal so while we enjoy good food we don't want to waste money on a bad experience. In our Asian travels, the question became, "Do you think this IS a place to eat?" So, there we were, hungry in Xi'an, searching for a place to eat. We had already rejected one option because they had no pictures on the menu (expecting English would have been way too much to ask for but we can make do with pictures). We found a little place with people inside eating at small tables. There was a picture menu (all writing in Chinese of course) so we decided to give it a try. We stepped in the door and a woman rushed over to us and began chatting away. Rather than seating us at one of the empty tables she motioned for us to follow her as she lead us through the dining area to some stairs. We followed her up the stairs going past another floor which also had people sitting at tables eating (with plenty of empty tables) and up to the third floor where they was yet another room full of tables but this one had no other people in in. After flipping through the menu perusing the pictures while the waitress stood by waiting, we pointed at a bowl of noodles and hoped for the best. When the food arrived it looked absolutely nothing like the picture we thought we had ordered. Perhaps the staff determined that what we had ordered was unlikely to appeal to Western tastebubs. Perhaps we had ordered wrong. Perhaps all the dishes looked nothing like the photos. In any case we picked up our chopsticks and dug in. Now, let me just state for the record that we had been living in Asia for three years at this point. We were all accomplished with chopsticks. But not with this dish. These were the widest, slipperyist noodles I have ever encountered. You would lean forward and think you had one captured on your chopsticks. 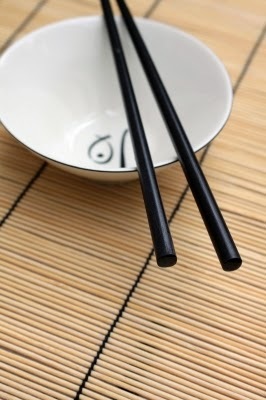 You'd lift it cautiously up to your mouth, open wide and at the last moment it would slip through the chopsticks to fall back in the bowl with a splash. We were all eating out of the same bowl, so soon all of our heads were practically touching in the center of the table as we positioned ourselves so as to minimize the distance the noodles had to travel from bowl to mouth and maximize the chances of getting the delicious noodles into our mouths. Because, make no mistake, these noodles were absolutely delicious. The best noodles I have ever had or ever expect to have in my entire life. And all five members of the family loved the noodles. Do you know how often in all of our travels all five of us have enjoyed the same dish? It didn't take long before we realized that we had an audience. After the waitress set our food down, she backed away and stood against the wall of the room and watched us eat. She was quickly joined by a few other waitresses who also stood watching us. They were soon joined by the kitchen staff. It wasn't long before at least a dozen people in restaurant uniforms stood silently around the perimeter of the room and watched us eat our noodles. Which might have been intimidating but in truth, the noodles were so tasty, and actually getting them into our mouths so challenging and the whole situation so absurd, that we were all just a giggly joyful mess. And may I point out that laughing does not enhance ones chopstick handling abilities. We finished the bowl and ordered another one and then another until we were satisfied. It was one of the best and also one of the cheapest meals we ever ate overseas. It was also the most entertaining. For us and for the restaurant staff. *Translation: "Will it be affordable, tasty and have food the picky children will eat?" I ate the most expensive albeit also the most delicious grilled cheese sandwich of my life in Paris after Imagination Boy rejected what I figured was a sure fired child pleaser. **Unless you count Gelato, which I don't since it is desert and even there we all had to have our own flavors.